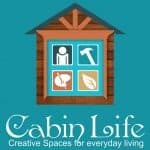 Cabin Kits from Cabin Life are a very affordable and simple way to create extra space at your place. This simple construction method has been around in Europe and Canada for many, many years and Cabin Life has made it simple for Australians to enjoy it also. In this 2 minute video you can see how simple it can be to construct one of our cabins called the Woodstock. 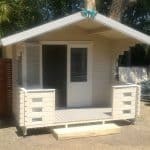 This cabin used steel posts instead of our standard 125mm round treated pine posts. There is no difference in the methods used, it was just the preference in this build for steel posts. ‘How to Video’ for the Sub Floor Frame Build for all Cabin Life cabins. Here it is! We have made a video to show you how to install a Cabin Life sub floor base kit and posts. While most of our cabin kits are as simple as Ikea furniture to put together, the hardest and most important part is getting the sub floor base level and square.In this video we show you how to construct a square and level base kit which is the exact same for most of our cabin kits in the range. This is a D.I.Y content video on how to build a Cabin Life Timber Cabin on top of a slab of concrete instead of pillars. Adding your aluminium window sills, is a very simple process. This is a D.I.Y content video on how to build a 70mm cabin window for a Cabin Life cabin. This short video shows you how to adjust your veranda posts on your cabin.. Putting on the roof batons is the same process on all timber cabins when a colourbond roof is installed. How to install the roof beams on a cabin life cathedral style roof if your cabin requires you to do so. How to install your storm rods for high wind or cyclone areas.